Machines of class 1191D have replaced class 191D machines. 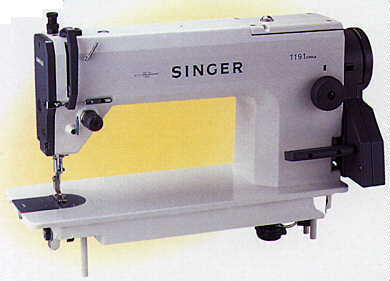 Class 1191D machines are a medium-high speed version within Singer's "91" family of medium-high through ultra-high speed machines. Other members of the "91" family include the 191D, 291U, 391A, 491U, 591U, 591D, and 691U. For stitching light through heavy weight materials. Designed for natural and synthetic fabrics and light to medium weight leather. Used for clothing and other manufacturing where speeds above 4500 s.p.m. are not required. Made and assembled in Japan. Fully automatic, fully pressurized lubrication system. Built in, precision feel knee lifter. Large, easy to turn feed regulating dial. Responsive feed action when operating feed reversing lever. Easy to depress feed reversing lever. Bed Size 18.75" x 7" 18.75" x 7" 18.75" x 7" 18.75" x 7"
Work Space to right of needle 11" 11" 11" 11"